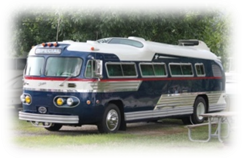 Come join the reunion of FLXIBLE bus owners as we gather in Loudonville, Ohio – home of the FLXIBLE bus for our bi-annual gathering. Meet the F.O.I. members and join the fun and festivities. Everyone is invited. Bring your FLXIBLE bus, converted coaches, motor homes and visitors are all welcome!! We will be happy to send rally reservation forms and rally information to you !! You have to make camping reservations separate from Rally, contact Mohican Adventures, Tell them you are with Flxible Rally, see website below.